We took a trip to Sicily this past summer and have recently been missing this island (the largest in the Mediterranean). It is officially a part of Italy, but could very well be its own country with the diversity of culture and cuisine. 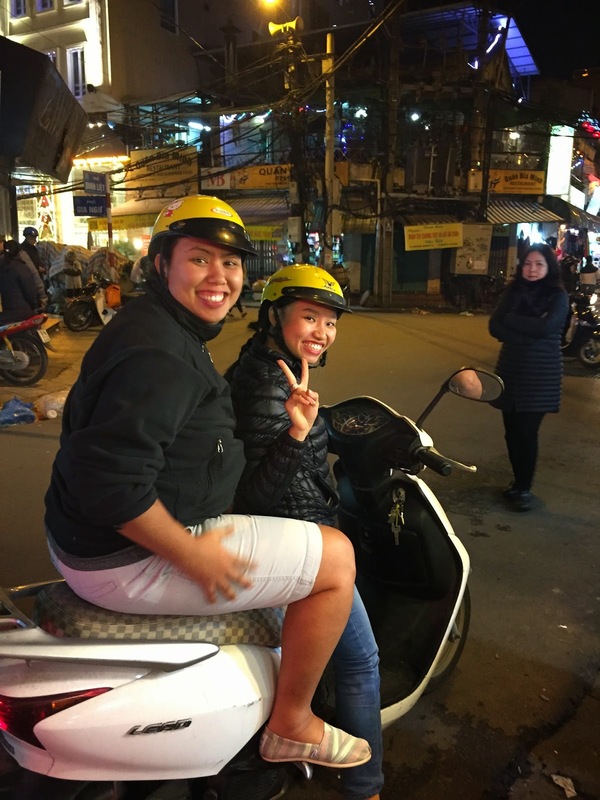 It reminded FloJo of her visit to Spain and Portugal and how different the cuisine and culture can be even though these countries are like two side-by-side states. Sicilian cuisine has it's foundation as Italian, but it is spiced and flavored by the rich and mixed history of this island having been invaded by the Arabs, Normans, Greeks and Spanish over the last few thousand years. The cuisine has literally incorporated influences from all of these invasions to form how inhabitants eat today. 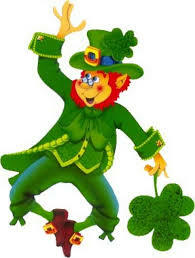 For example, the Spaniards introduced the island to foods like corn, turkey, cocoa from the New World. The Arabs brought citrus fruits and spices like saffron, nutmeg, cinnamon, pepper and cloves. We saw eggplant featured in a lot of dishes including the Sicilian classic Pasta alla Norma, which hails from Catania on the East Coast of the island where we spent our last night in Sicily. 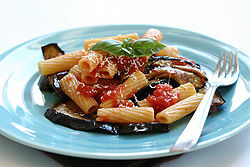 Neither of us are eggplant fans (although we love the beautiful color) so we have yet to try this dish. Catania was settled by Greeks who made the short trip to colonize the island. They brought olives, beans and pistachios. We were initially surprised how often we saw pistachios used in Sicilian dishes. 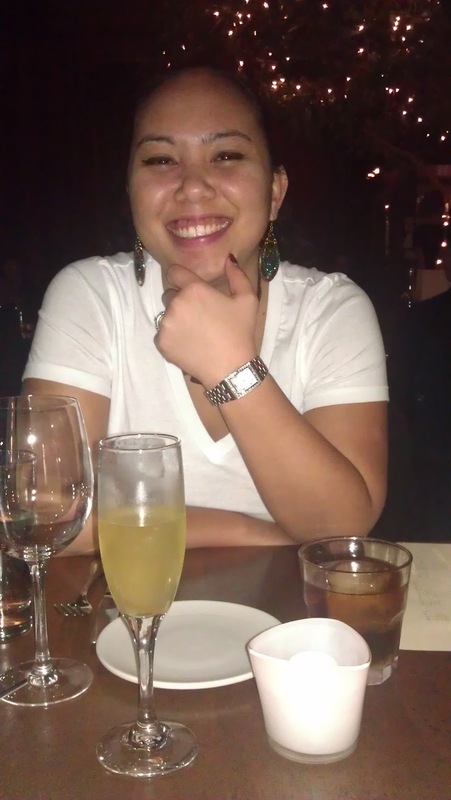 For FloJo's birthday weekend we decided to undertake the Sicilian experiment. 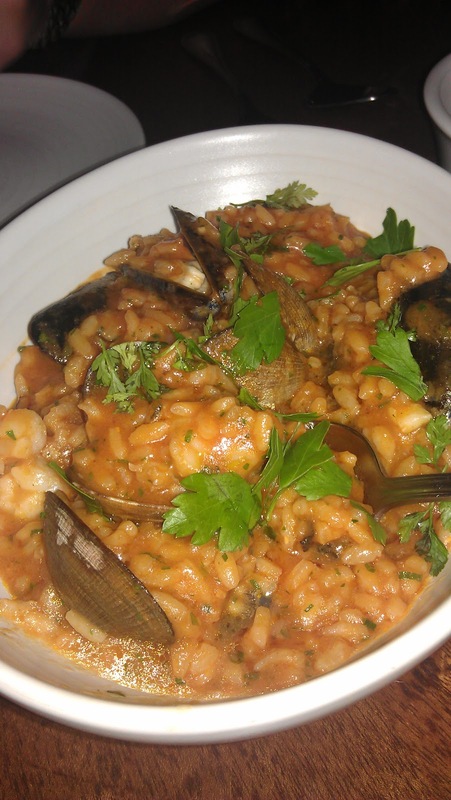 The goal of the experiment was simple, to find authentic and delicious Sicilian food in Seattle. Was this to be a mission impossible? 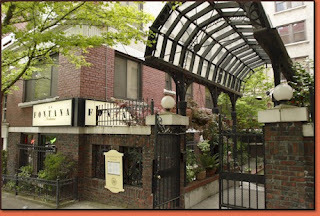 The first restaurant contender held a lot of promise, La Fontana Siciliana. Owner Mario Fuenzalida is Sicilian and from his restaurant's website we read that he honored the homeland by using fresh vegetables and ingredients on his menu. This always makes for an authentic experience and a quality end product so we were excited to give this place a try. The Belltown restaurant is hidden amongst an apartment complex on Blanchard street that we've passed by numerous times, but had no idea there was a restaurant just beyond the courtyard. 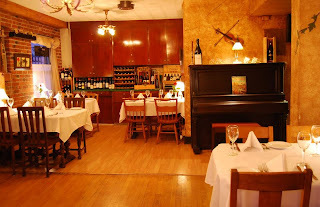 Upon entering the restaurant we noticed it was very folksy and had a small trattoria feel to it. We sat at a very skinny table for two in the first of two dining rooms. The atmosphere was charming and had a very old world feel. Our hopes were raised a little higher believing we would be having an authentic Sicilian dining experience. Our waiter greeted us enthusiastically and brought us water in glasses that resembled milkshake glassware. 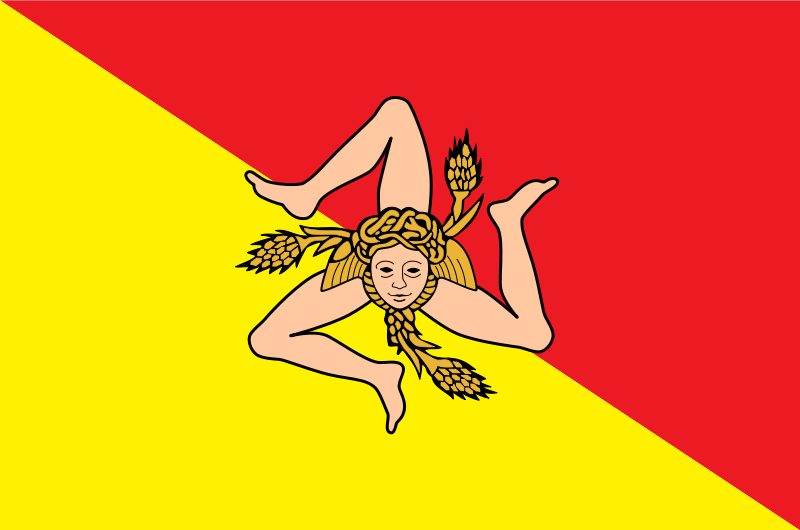 We pointed out the Sicilian flag hanging in the restaurant as we had seen the three legged woman everywhere in Sicily. Our waiter admitted he was not Sicilian and demonstrated using his leg that he was from the part of Italy right before the foot. However he gave us a very good explanation of the meaning of the flag. 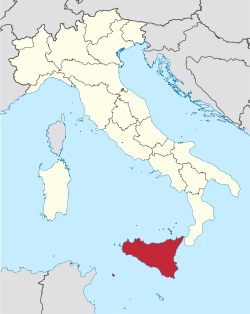 The symbol we had been seeing all over Sicily and the center figure of the flag is known as the Trinacria, which was another name for the Kingdom of Sicily. The face was from greek mythology he explained and represented the head of Medusa surrounded by wheat ears that represented the importance of fertility and agriculture. The three bent legs represent the three corners of the island. He left us to reveiw the menu after our short lesson on the flag. He then took our order, which included bruschetta (crusty bread with tomatoes) as an appetizer. However, instead of putting our order in, our overly charming waiter decided to go smooze with the table across from us for about ten minutes. We knew we were going for Sicilian food, we just didn't know that the dinner was going to be the 3-hour affair that was customary in that country. When he passed by again, he told us our order was just put in and our bruschetta would be coming pronto (this was about 30 minutes since our arrival). We devoured the bruschetta, not because it was exceptionally good (it was ok), but because we were starving by the time it arrived. Unfortunately the toasted bread with tomatoes was the best part of the meal. Both of our entrees were disappointments. FloJo had the Cannelloni di Pollo, tubes filled with chicken and ricotta cheese with tomato sauce on top. When it came out immediately we commented the cheese on top looked like it was still frozen. The plate was not very appetizing nor the dish. Unfortunately, it tasted like a frozen dinner that had not been microwaved on high long enough. 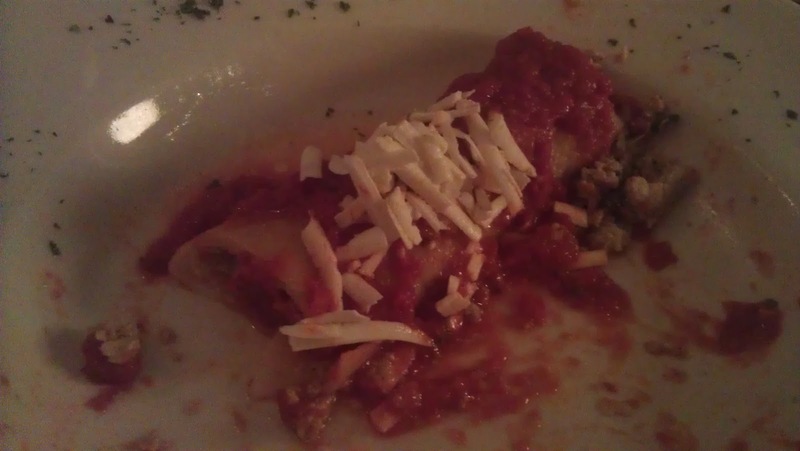 For $18.95 the expectation was something of much higher quality and better taste. Ro's seafood medely was the daily special. Again, there was nothing special about it. 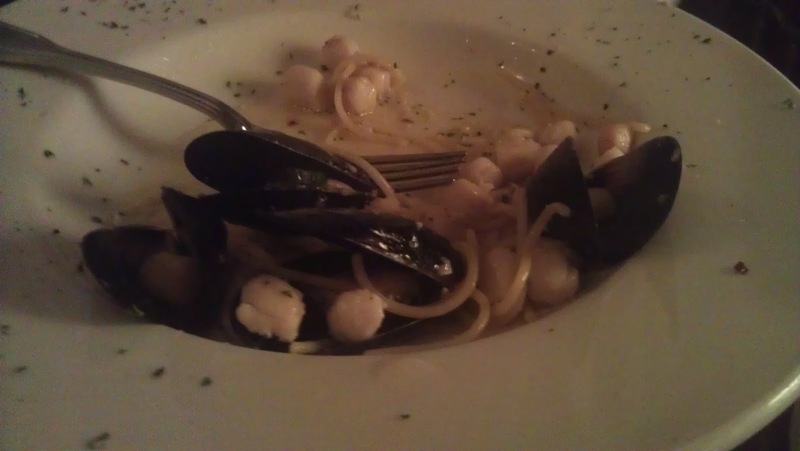 It was comprised of spaghetti noodles with tiny bay scallops and mussels that had not been properly soaked and rinsed to get all the grit and dirt out. TIP: Soak mussles in water with1/4 cup flour for 30 mins and ta-da, all the dirt will be out. We passed on dessert as we didn't want to a) wait or b) be disappointed again. Dinner was not cheap and we definitely felt like we overpaid for both the service received and the half-eaten food we ordered. Even with a Groupon discount we didn't feel like this experienment was worth the investment. One unexpected, but cool thing about the restaurant, although somewhat out of place, was a duck press sitting on their front counter. This machine is used to literally press duck parts, blood and marrow into a traditional French dish called Caneton à la presse. Warning: skip the rest of this paragraph if you are at all queezy. The dish was developed by the Tour d'Argent restaurant in France in the 19th century. The process begins by strangling the poor duck to retain the blood. It's partially roasted, limbs and breast are removed and then the liver is removed, ground-up and seasoned. The remaining parts of the duck (skin, bones, meat) are put into the machine and pressed down to get all the juice and blood out of the carcass. This extract is then combined with butter and cognac to create a sauce that is cooked with the breast. This is normally the first course and the broiled duck legs the second course. 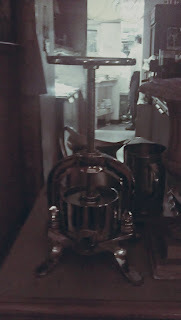 Our question is what is a French duck press doing in a Sicilian restaurant? Overall, we had to say part one of the Sicilian experiment was a fail. But, we only had to look forward to the following night for part due (two). We had been excited to try Agrodolce (which translated means bitter-sweet) ever since we learned that Maria Hines was visiting Sicily about a week after we returned. We followed her tweets and Facebook posts watching to see where she visited and what kind of food and wine she was trying. 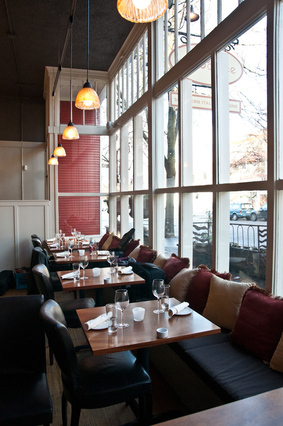 Agrodolce opened up where the 35th Street Bistro used to be in Fremont. It opened December 21st, the same day the Mayans predicted the world would end. Thank goodness that didn't happen so we had the opportunity to visit and explore the tastes of Sicily through Maria's senses. Many of you probably know Maria from her first restaurant venture in Seattle, Tilth, which focuses on organic Northwest ingredients and was named to the New York Times top-ten new restaurants in 2008. She's battled on Food Network's Iron Chef and was on Bravo's Top Chef Masters Season Two. 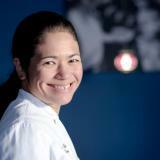 She's also a 2009 James Beard Best Pacific NW Chef winner. So with all the street creds Maria comes with and the fact that she visited Sicily to help shape Agrodolce's menu we again were excited to try the Sicilian experiment part two. We really wanted to try the arancini with Skagit River beef (fried risotto balls we had stumbled upon for breakfast one morning in Palermo), but knew we had to pace ourselves. We would promise to come back and try the rice balls, however. 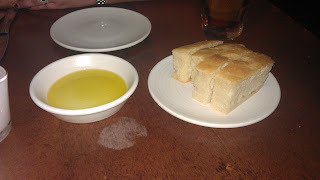 We did have to try the house made focaccia with sea salt and olive oil. So simple, but so yummy and the bread arrived within five minutes of us ordering it. We snacked on that while indulging in some cocktails, it was a birthday celebration after all. Ro had the beautiful ugly made with gin, cynar, carpano antica and averna. It was definitely spirit forward, but well balanced. The term beautiful ugly is urban slang used for models that either have such odd or striking features they could either be considered beautiful or ugly. It just goes to prove the old saying, beauty is in the sight of the beholder. FloJo had the Carpri Sun made with sparkling wine, limencello (yum) and grapefruit. So much better than a juice box, but just as easy going down. 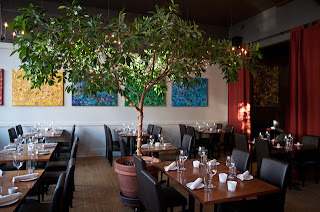 Maria is one of the few chefs to have all of her restaurants certified organic by Oregon Tilth, which means that 95% of the food products she purchases must be certified organic or they make them in house with certified organic ingredients. 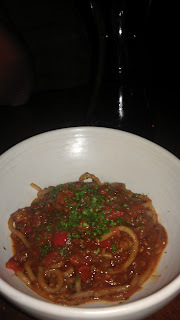 FloJo had the spaghetti with Skagit River Ranch sugo, hot pepper marinara sauce and a sprinkling of parsley. Skagit River Ranch only raises certified organic meat. The hand-made noodles were very good and it makes it taste better knowing how much labor went into making them. 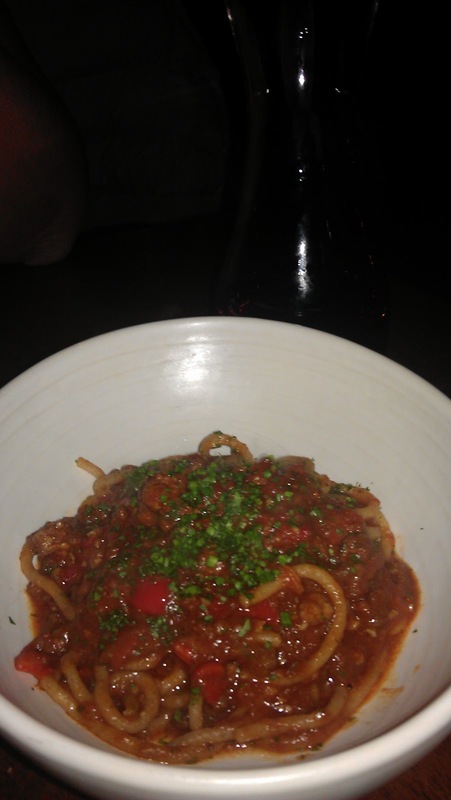 The sugo sauce had very deep, comforting flavor. Sugo all'amatriciana is a very traditional Italian pasta traditionally made with guanciale (pork cheek or unsmoked bacon), tomato sauce and pecorino cheese. This dish is originally from the Lazio region of Italy, but has spread throughout Italy so it would not be surprising to find it in Sicily. At the end of the Sicilian experiment it really was no contest. On paper, you logically would have given the restaurant with Sicilian ownership the nod. 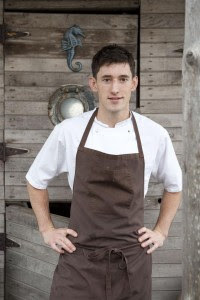 But, at the end of the day, what is almost always true, quality ingredients used by a creative chef will always win out. It's a bonus to support a chef that is earth conscious and consistently demonstrates her support of local organic producers. 11:30 a.m.–2 p.m. and 5–10 p.m. Tues.–Fri.